19, of Farmington, ME; assigned to D Co, 4/160th SOAR (A) at Fort Lewis, Washington on May 23, 2008 beginning his career supporting Special Operation Forces in the Global War on Terrorism, died Saturday, November 29, 2008 at Madigan Army Medical Center in Fort Lewis, Washington. He enjoyed hanging out with his friends and family, wrestling, hunting, fishing, weight lifting, golf. Blaine also enjoyed the time he spent at the Foster Vocational Technical School in the carpentry program. Blaine was full of surprises. He loved to help others, protect others and always stood up for the little guy. He surprised his mother by an unexpected visit to see her and always offered to help his mother whenever he observed a job that needed to get done, or something for which she needed assistance. Blaine was kind, giving, determined, and had an exceptional work ethic. He loved the outdoors and had a strong will, never giving up. No matter what, he was a protector and giver. To honor Blaine, his mother, Kenda Adams, along with the help of her daughter, Millissa, unearthed and donated this stone from the Sandy River near Farmington, Maine. Specifically, the stone came from the Fairbanks Bridge in Farmington where Blaine swam fished, and searched for snapping turtles. He and his friends retrieved golf balls from the river bed and would even wade through the river to make a 3+ mile trip home into a 1/2 mile trip just by braving the cold, getting wet and taking this strategic but somewhat dangerous shortcut. The stone is one of a kind, has a unique zig zag stripe down the center and in Millissa’s view, represents Blaine’s brokenness as a fallen hero, but in Kenda’s view, it represents a stairway to heaven so Kenda can once again be reunited with her son. On a beautiful late June day, it was my honor to hike with ARMY PFC Blaine Adams’ memorial stone. I was a part of a small non-hosted TSP hike. This day was a very special day for me, for one, I was with members of the TSP family, second, I was back in the Maine woods and away from the coast (the woods will always have a spot in my heart), thirdly, I was completing a bucket list item for myself, and last but not least, I was able to share the memory of one of Maine’s Fallen Heros. Everything that I found on Blaine truly made me think that he was a true Mainer. He spent much time with friends and family, he loved to be out hunting or fishing, and he enjoy working with his hands during his carpentry program. Along with those traits he was a kind, giving, young man who was always determined and willing to help out. This was probably one of the most difficult hikes I’ve ever done. I kept thinking of Blaine along with other fallen soldiers whom I’ve learned about through TSP. Nathan, Mark, Edmund, and my brother, Dustin. I kept thinking of the zig-zag pattern on Blaine’s stone from Sandy River. The terrain on the Helon Taylor Trail and the Knife’s Edge Trail were full of zig-zags. Each ache and pain with the trek upwards was met with determination to get Blaine up to the very top of Katahdin. 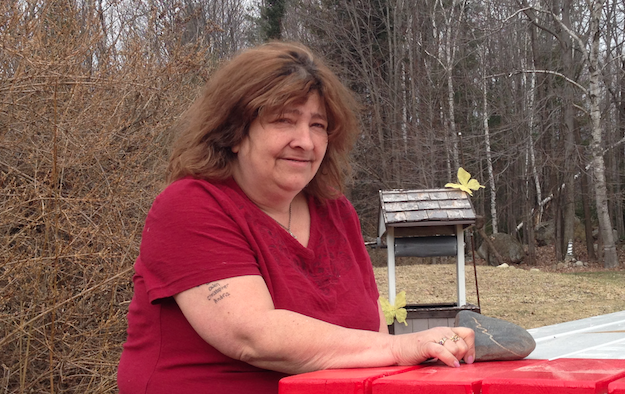 When we had gathered for our ceremony, I spoke of Blaine’s character and how he seemed like a true Mainer in my mind. I mentioned the stories of the zig-zag line on the stone, the brokeness and the stairway. I always find some type of odd or unique connection with each stone that I have hiked with through the TSP. For Blaine’s stone, it was merely a snapping turtle. I had learned that where his mother and sister retrieved the stone from the Sandy River, Blaine enjoyed swimming there, fishing, and searching for snapping turtles. I grew up north of Katahdin where you would think there would be thousands and thousands of snapping turtles all over the place. I had only seen one or two that I remember. The whole week leading up to this hike of Katahdin, I couldn’t turn onto a paved road or dirt road without encountering a snapping turtle. I must have seen at least 15 the week leading up to the hike. Just an odd little connection that I found leading up to this hike that was on my mind while carrying the weight of his stone and his story. I was and am honored to have carried Blaine’s stone to the summit of Katahdin. I hope through the Summit Project his family finds some healing. Being a Gold Star Brother I know these hikes have helped in my healing. I will always remember Blaine on any other hike again. I will especially think of Blaine whenever I stumble upon a snapping turtle. Thank you for taking my son, PFC Blaine Adams’s memorial stone on your journey up Mt. Katahdin, and sharing your story of how you felt connected to my son. So many snapping turtles made me smile. that doesn’t happen often, thank you.Thank you for showing me that others can and will honor my son and his service to our country. Thank You All for honoring my son PFC Blaine Adams, it means a lot. It was a typical start to the day for me, which quickly turned into a day of many emotions. I was a bit nervous, excited, emotional, honored and happy. When I arrived and was handed Blaine’s rock, I remember thinking to myself is it ok to smile? I didn’t want people to think I wasn’t serious about this, but smiling felt right. I smiled because I was so proud to be holding such a special rock honoring your son! While walking with many others carrying stones, I had time to look around and feel proud of all the businesses and townspeople who lined the streets to clap and honor the fallen soldiers as well as the Veterans who were also walking. I had the honor of walking with an older gentleman who was a veteran and heard so many stories. It is heart wrenching to hear some of them, but at the same time to see how proud this man was hit me really hard. I would love to be involved in TSP again in the future. That was one of the most amazing experiences for me! After I watched your video and read the article, a few things hit me. When you said that the zig-zag on the rock symbolized the stairway to heaven to be with your son again, I lost it. My heart ached for you, as I have suffered a huge loss in my life as well. Also, I had to chuckle when reading Blaine loved to try to catch snapping turtles. There is a huge one lingering around our camp that we have been trying to catch for years! He keeps out smarting us! I would have loved to get some pointers from him! I would like to send you my most sincere thoughts and prayers for all of the heartache and emotions that you have experienced over the last several years. You seem like a strong woman, I can see where Blaine got that from. Thank you for raising a son who was honored to fight for his country and always fight for the “little guy”. To me, that is heroism at its finest!! RIP PFC Blaine Nicholas Benjamin Adams! Thank you for sharing your journey with my son’s stone. When you mentioned wanting to smile after being handed Blaine’s stone touched my heart, because Blaine was always ready with his crooked smile. Thanks again for sharing. When my son, PFC Blaine Adams finished his basic training in the US Army, he told me that he hoped for the chance to go to Germany. I decided that I would go there to honor Blaine’s memory. Blaine didn’t say what town or city, so I asked his Sargent. Blaine’s Sargent recommended Berlin, Germany. So I began making my plans. I figured what better time to take this journey than the week of Blaine’s birthday. It was too short of a notice so I was unable to take Blaine’s TSP stone, but that was okay. 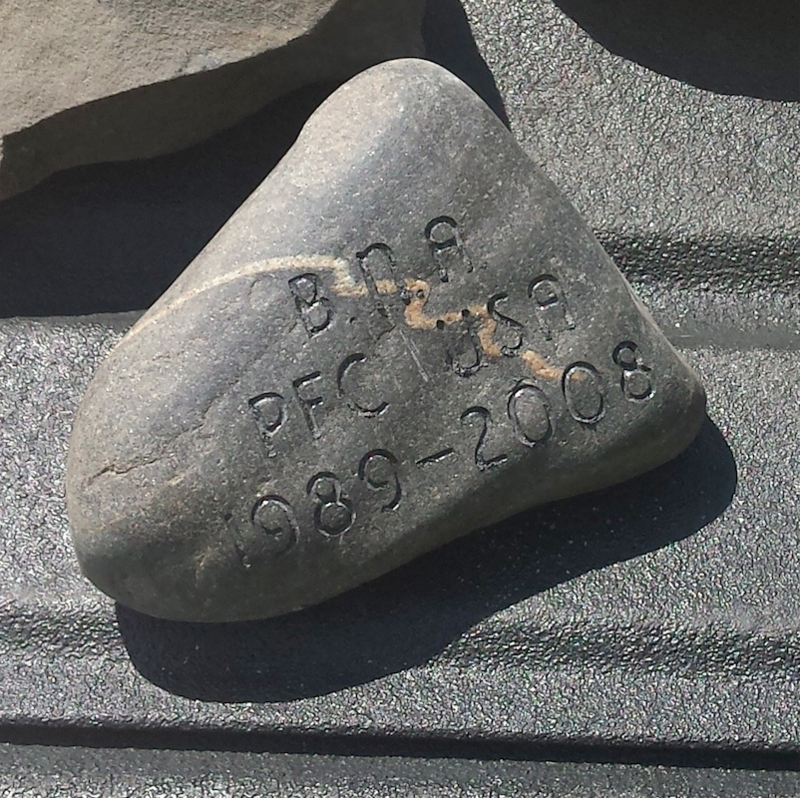 I had my own little stone that I found at Portland Head Light the day I went to see Blaine’s TSP stone in person after being engraved that I dedicated to Blaine. I had his dog tags, and I carried his memory with me every step along the way. This journey was terrifying for me, taking this trip alone, being afraid of flying, going to a foreign country. Maybe I shouldn’t say I took this journey alone, for any time I felt afraid I would gather Blaine’s dog tags and stone and hold on to them tight and felt a great comfort and courage wash over me. I had a whole list of things I wanted to do in Berlin, Germany that I thought would honor Blaine’s memory. I went to see Check Point Charlie, (even had a picture taken with the guards, with a push of courage from Blaine to asked someone to take the photo). the Brandenberg Gate, The Victory Column, and so much more. It was like Blaine guided me to what he wanted to see. Showing me he had grown up and his interest had changed since being a child. No longer into dinosaurs and Egyptian archaeology/pyramids, but more into world history. So the Natural (Dinosaur) and Egyptian museums were scratched from my list of things to honor Blaine. I guess even a parent can learn more about a child’s interest even after their passing. This past Saturday, PFC Blaine Adams stone was placed into my hand. It was smaller and lighter than I anticipated it would be, but the distinct markings of the stone moved me beyond measure. I was completely overcome with emotion at the sight of the “stairway to heaven”. When I first started to learn about Blaine, I wasn’t sure how I would be able to find a way to connect with him. We were from the same area–had probably been to the same places in Farmington hundreds of times–but still, he was a boy when he passed. Then I made the connection–I am raising boys. My sons are younger, 6 and 10, but they are growing up and learning to love some of the same things that I read that Blaine loved–hunting, fishing, and wrestling! I learned from Blaine’s mother, Kenda, that not only did Blaine wrestle on the high school team, but also, that he loved WWE and who his favorite wrestlers were. During our 5k this weekend, I carried my sons Randy Orton t-shirt so that Blaine would know that my boys were thinking of him too! During the prep to walk with the team, I thought about Blaine and the things he must have seen or done during his service. There were days that I felt tired and didn’t want to train but I thought maybe he had those days too–and because of his commitment to our country, and his resolve to never quit, he got up and did his job. Therefore, so should I. The more I learned about this extraordinary young man, the more energy I found I had. I began hiking with my family–something I had never done. Blaine’s courage–and the courage of his family, inspired me along the way. I would like to sincerely thank PFC Adams and his family for their sacrifice. As a parent, Kenda, I want you to know that when I had to return the stone you so carefully chose for your son, it was the first time in a very long time that I didn’t want to let go of something. I am so honored that your stone, Blaine’s stone, was placed in my hand and heart. Thank you, Meredith for hororing my son by taking Blaine’s stone on your 5k, and the kind and meaningful words. I had the honor and the privilege of carrying your son Blaine’s stone and story up Cadillac Mountain on October 17, 2015. When I was asked to pick the solider whose stone I would carry, I picked Blaine’s stone because you and his sister, Millissa, had selected it from the Sandy River. I grew up in Mercer on a small farm along the banks of the Sandy River. My father sold the farm in August. It was a simple as that – I wanted to carry a stone from the Sandy to have a connection to home…yet, it became much more. On the days leading up to the hike, I thought more about your video and Blaine’s story. I could picture him playing with his friends in the river – fishing for brown trout, skipping rocks, hunting for snapping turtles – because I had been that kid too. And the more I thought about it, the smaller the world became…Blaine just wasn’t a soldier I was choosing to honor by taking part in the Summit Project. We had stood in the river; the same water had passed over our feet. We probably have been to the same places in Farmington and we probably know some of the same people. He was a little boy I might have stood behind waiting for an ice cream at Gifford’s. Then, I read some of the tributes on the memorial page attached to his obituary online and I realized Blaine was someone I would have chosen to be my friend. But because he made the ultimate sacrifice for his country and only lived a short 19 years, I will never have that opportunity. During the hike because his stone was small enough, I kept the stone in my pocket mostly. I wanted to carry him with me – not just in my backpack. When we would stop to look at the views, take photos or have a snack, I would take the stone out of my pocket and hold it in my hand. I wanted him to be a part of every experience. Since the hike, I have missed carrying Blaine’s stone in my pocket. I have wanted to pull it out so he could be part of the things I was experiencing. It took me awhile to realize that I didn’t need the stone that just remembering him during life’s moments means that I now carry him with me. Even yesterday, I was going back and forth about whether or I not I would vote…it was just a small local election. Then, I thought about Blaine and other like him and what they gave for our freedoms. I voted. I read about your trip to Germany. I traveled to Berlin when I was in high school and visited so many of the spots that you did. How incredibly brave and very cool of you to take that trip on your own! I was proud of you for taking the leap and going halfway around the world. I can only imagine that your son was too! Kenda, please know that your son is remembered. Thank you for sharing him and allowing me the chance to honor Blaine and his story as a Maine and American hero. I cross the Fairbanks bridge a few times a year and I already know that I’m not going to be able to look out on the river without a seeing a young boy with his friends hunting for snapping turtles. I spent this Memorial Day weekend a little differently than most people. Instead of sitting at camp, with a beer and some barbecue, I was on top of a mountain. And I wouldn’t change it for the world. On May 29, 2016, I had the honor of carrying your son with me at Baxter State Park. It was such a life changing experience that I’m not even sure I could put into words, but I will try my best. I have done a few different events with The Summit Project. Nothing huge or particularly challenging for me, but I always enjoyed them. When I heard that TSP gets together over Memorial Day Weekend, I knew I had to be a part of it. I signed up and soon enough I had my hiker assignment – PFC Blaine Adams. I was excited to start learning about my hero. I read a few different stories about Blaine. He had such a huge love for wrestling, hunting, and you. I couldn’t wait to share him with the rest of my hiking group. I was part of Team Red, which of course was the first group to head out to the mountain. I woke up at 4 am, which wasn’t ideal. I walked down, had some coffee, and boarded the shuttle with my team and Blaine. I had heard that the trail we were going to hike, The Owl, was very challenging. Admittedly, I didn’t train for this hike at all, which I would definitely regret. It was a rainy, cold day in Millinocket. The trail started off fine, but then the elevation increased and there were a lot of rocks that needed to be climbed. I was out of breath. This was by far the hardest thing I have done in my entire life and I wanted to quit so badly. I actually thought about faking an injury just to get off the damn mountain. But then I remembered who was right there with me. Blaine and I were in this together. I wasn’t doing the hike for me, it was for him. Thinking of his sacrifice gave me the strength to get over those rocks and reach the summit. I know that Blaine loved the outdoors and probably would have loved hiking that mountain. I did it for him. Kenda, I don’t know what else to say. I have a brother who was in the army. He deployed to Afghanistan for almost a year, but he came home. I am forever grateful, but also guilty. I don’t know what I would have done if I lost him. I can’t even begin to feel your pain, but just know this – Blaine is NOT forgotten, and he NEVER will be. I thank you for your sacrifice and I hope you know that this Memorial Day Weekend is one that I will never forget, thanks to Blaine. Thank you Colleen for honoring my brother Blaine. I want to say thank you, to you and your family for your brothers service and your families. My family and I appreciate it. My brother not making it home and how he died has devoured every inch of my soul. I miss him. I have flashes of the nightmare of his final days. Luckily I had my son which is now 9 yrs old and my parents. Without them I may not have survived losing my little brother. I was completely honored to hike Bald Mountain, in Oquossoc, on this rainy September 11 and carry Blaine’s stone with me. I took part in this wonderful project, not really knowing what to expect, and when I discovered that not only did Blaine serve in the Army, as my husband did, but he also grew up in the same town my husband did – only one town over from where we now live. At that moment, I knew I was meant to honor Blaine on this day. As we waited to start our hike and picked up our stones, I didn’t have too many emotions running through me, but as we started up the mountain, I was flooded with a million emotions; I thought about Blaine and how young he was, and how much he enjoyed the outdoors, I know he was with me as I hiked on this rainy day. I thought about all the fallen soldiers we were honoring that day, I thought about their families, their friends. I thought about the zig zag pattern on Blaine’s stone, and the significance behind it. As we all gathered to share some stories of those we were honoring, the sun peeked through the trees and it was just perfect. Although I thought about the sadness Blaine’s family and friends must feel, I found myself with a smile on my face as we hiked back down, as I thought about the time I had just spent with Blaine on this rainy hike, that ended with some beautiful sunshine. I really felt like he was with me. I want to thank Blaine, and all our fallen, for their service and sacrifice to this wonderful country we live in. I want to thank Kenda, for her sacrifice as well, – I was very humbled to be able to take part in such a powerful day. For the last couple of months I have enjoyed the process of getting to know Army PFC Blaine Adams… The summit project chose Blaine’s stone for me to hike up Cadillac Mountain with this past week. As I began to learn his story and life better, I began sharing it w those family and friends I came in contact with. My heart is saddened as I think about how , much too soon, his life was shortened. However, I am at the same time filled w joy and happiness, knowing how he lived his life during those years, how bravely he served our country and how he has touched so many lives since. I too, raised a boy, and feel certain we share many similar memories about our boys experiences. Those memories never leave us . Those memories also bring smiles to our faces at the most unexpected moments. For me, making ‘ moments ‘ in life are very, very special. Some of those ‘ moments ‘ bring smiles and some bring simple ‘ remembrance! I trust your ‘ moments’ are as special to you as mine are to me. Thank you for being so open and willing to share his life w others and thank you for giving me new and special ‘ moments ‘ to reflect upon in the yrs ahead. Hiking up Streaked Mountain with my English class and carrying the stone of Blaine was an honor to me. I’m happy to say, I enjoyed learning about your family member and everything he has done to help our country. When I heard about the trip and how we were taking up stones of veterans who have passed I immediately thought of my grandfather who passed away in 2008 he was a veteran of the United States Army. I decided to bring my grandfathers’ dog tags on the hike with me, holding him close to my heart along with the other veterans we were thinking and honoring that day. I was happy to be given the opportunity to have a day honoring and celebrating the life of people who helped our country in many ways. It really touched my heart learning about Blaine, knowing as little as I do. I was pleased to find out he began his career supporting special operation forces in the global war of terrorism. This must having been a hard time to experience. Protecting our country is a scary thing to do, but he was brave enough to help and risk his life. I’m very happy to have the opportunity to be writing this letter and explaining how this opportunity impacted me. I think it’s really great how your family decided to join The Summit Project. I know for a fact that it has really taught me and my class mates a lot. When we finally reached the top of streaked mountain we had a ceremony. We all sat in a circle and were given a chance to talk about our soldier. Most of us thanked the soldiers for their service and for protecting our country. Everyone had a soldier and it was an amazing opportunity to learn about these veterans and what they’ve been through. Finally, when it was my chance to talk, I thanked Blaine for his services and talked about where he was from, along with what he did. Hearing everyone’s story meant a lot to me especially knowing that any of these people could’ve known my grandfather who was also in the service. On Sunday, November 20, 2016 I had the honor to carry the stone and story of PFC Blaine Adams, US Army. We gathered at LLBean in Freeport for a brief study session on our soldiers before our hike up Bradbury Mountain. It was a rainy and chilly but our spirits were upbeat as we prepared for our day. Dave Cote had planned this outing as a service project for three Naval Academy midshipmen who were home for their Thanksgiving break. I am always happy to participate in any Summit Project events that I can. I feel that the time I spend hiking, learning about our fallen and quietly reflecting on their service and sacrifice and that of their families is always time well spent. What I learned about Blaine was that he was a kind young man who was helpful to others and especially to his mother Kenda. He was involved in carpentry and liked to spend time in the outdoors. He liked to have fun and had many friends. He also looked out for others. He was skilled at catching snapping turtles. This fact makes me smile! During our hike I kept thinking that if he were still with us that maybe he would be a involved with TSP. I also kept thinking about his mother and sister, Millissa these past days since our hike. The anniversary of Blaine’s passing was on November 29th. These days are hard. I want them to know that they were thought of and Blaine was remembered. I have hiked several times with TSP on hosted and non-hosted events. Once I carry a soldiers stone, their story stays in my heart and on my mind forever. I have been forever changed by being part of TSP. I am grateful that as a non-military person that I can contribute and connect in some way with our servicemen and women who do so much for us. I am also grateful to their families who also share in the sacrifice of their commitment for the greater good. I work in an elementary school and everyday we say the Pledge of Allegiance. Everyday when I recite those words I feel connected to our servicemen and women. I feel pride and gratitude and have been able to share the message of TSP with others. I had the honor and privilege to carry the stone and the story of your son Blaine up Owl Peak, at the BSP event this year. This was my second hike with the TSP family and I was excited that I was able to participate in the event. In the days leading up to the event, I had found out that I had to work the night prior to the event. This put me in a position where there was a possibility that I wasn’t going to make it to the event. I remember reading Blaine’s bio and thought back to his “strong will, never giving up”. This quote really stuck with me the day before the event. As I got done my tiring late night shift, I thought to myself; “I have to make it to the event, I can’t give up”. So I pushed through my tiredness and got myself to the event. During my time on the hike I felt like I had a real connection with Blaine. I love being outdoors and in the woods; and on the day of the hike the weather couldn’t have been any better. I thought to myself that Blaine would have really enjoyed be out in the woods with us on the hike; enjoying the views, trees, and the sun. During the hike we had to cross a small creek. Both on the way up and the way down we had people fall in and get wet (myself included). Crossing this creek may not have been as dangerous as crossing a river like Blaine and his friends did. But, I saw both of these moments as signs. I thought that maybe Blaine had gone through a similar situation, by helping his friends who fell in the river get across. Carrying your son’s stone and story was such an honor. I believe that the experiences I had on the hike with Blaine’s stone will always be with me. And even though I never got the chance to me Blaine; I feel as though he and I would be friends if he was here today. On July 6, 2017, I hiked up Cadillac Mountain with eight other women, all carrying stones of beloved soldiers. I was honored to carry the rock of PFC Blaine Nicholas Benjamin Adams. When I learned about Blaine, his kindness stood out to me. As a schoolteacher, I was touched that he always looked out for the little guy, as there are always those who need some extra care. As a mother, I was touched by his love and care for his mom. I attended the University of Maine at Farmington, and I swam in the Sandy River many times. I love knowing that we had that magical place in common. Like Blaine, I also love the outdoors. Our hike took place on a beautiful summer day. We met many people on the Cadillac South Ridge Trail. We had taped flags to our backpacks so many people asked us why. All were grateful for our hike and The Summit Project, but they were most grateful for the service of your son. At the top of the mountain we placed the rocks in a circle and each of us spoke about our fallen hero. It was a solemn, moving moment. It was a privilege to honor your son. I appreciate his sacrifice so very much, and your sacrifice, too. My deepest sympathy to you and your family, and my gratitude, always. It was an honor to carry Blaine’s stone to the top of Black Cap Mountain. I shared Blaine’s story with over 50 people from our Cub Scout Pack. I learned that Blaine and I liked to spend time with friends and family and going fishing. It was an honor to carry this tone up Black Cap Mountain. I carried that rock like Blaine was in it. It was the best hike I have ever done and I got to share Blaine’s story with over 50 Scouts. I hope you love this letter as much as I loved this opportunity. Thank you for allowing me to honor your hero during Veterans Day weekend. It was a pleasure to have him in my pack as we climbed Blue Hill Mountain, and again as I carried him during the remembrance race in Ellsworth. On the morning of the hike, it was extremely cold, very windy, and it was a tough trail up the mountain. But knowing why we were all there, none of it mattered. We were honoring those who have sacrificed way more than giving up a cold autumn morning. Even though Blaine didn’t get the chance to serve that long, it gave me more motivation to keep going. He was set to do big things for the Army, and I felt like I could carry out just a little bit more for him. Even though I never met Blaine, I felt connected to him as soon as I was handed his stone. We had some things in common. We both came from small Maine towns, and both joined the military at 17 years old. He was a true American hero, and he should be honored and remembered forever. At a time when it was critical to America, he stepped up and decided he wanted to protect our freedom. I would have been honored to serve next to him, and part of my service will be for him, and his family. You all will be remembered by me, and will always have a place in my heart. I will continue to look for stones with stairways on them. I had the honor of carrying Blaine’s story and stone. The day of the hike had started out like any day you would have to wake up early, i thought this trip would just be a normal trip up and down. I would have never thought that so much bonding and love for one another would happen. We told the emotional stories about our fallen servicemember’s and their stone. I think one day I would like to join the service and serve my country, the same way Blaine chose to. What really struck home with me was the gaps in our ages. Blaine was only 5 years older than I am right now, when he passed. We both liked hiking and fishing and playing in streams. I really liked helping to keep his memory alive. A few days ago, my class had a project assigned: to carry a soldier’s stone up Tumbledown and honor their memory by telling their story at the top. I was assigned PFC Blaine Adams and immediately was struck with a sense of respect for him. He gave his life for his country at such young age, just four years older than myself. It was such an honor to carry his stone up the mountain. The hike was difficult, seeing as I am not a very athletic person, but every time I felt like stopping or complaining, I thought about Blaine and what he did for his country. It gave me a sense of humility and kept me going even when I was out of breath and sweating. Even though I am not great at hiking, I would do it again in a heartbeat if it meant honoring someone like Blaine Adams. It was truly an honor. It was an honor to carry your son and brother’s stone this weekend at TSP’s Acadia National Park 2018 hike. Learning about the life and legacy of US Army Private First Class Blaine Nicholas Benjamin Adams was both inspiring and heartbreaking to me. It’s evident from what I read about Blaine that he was a caring, hard-working, and courageous man. A man that died knowing what it meant to pay the ultimate price for his country, even though he was barely an adult himself. The world lost a great man on November 29th, 2008. He lives on in the hearts of those who loved him. It was a privilege to tell his story and share his name with others this weekend. It’s a story I will share with many others, including my first grade class. Hiking with friends and family on the Tarn trail on a sunny Saturday morning in Maine reminded me of how precious each moment of life is. It is a privilege that I have only because of the sacrifices that Blaine and many other fallen heroes have made. I feel extreme gratitude to Blaine for carrying the burden of these freedoms on his shoulders through his military service. My heart aches for the pain and enduring grief that the loved ones of Blaine felt and still feel today. It is a pain I can never understand, but can only imagine. I hope that knowing that TSP honors Blaine helps to create a space for some healing. In the creeks and streams that we passed on the trail, I looked for turtles recalling that Blaine enjoyed many adventures searching for snapping turtles in Farmington. I wasn’t successful in finding one on this time, but I smiled thinking of this memory of a boy playing outside with his friends. It’s a truly innocent image that comes to mind. It’s a reminder that Blaine lived only one year of his life as an adult. He died at only age 19. He did not get the chance to start a family of his own, explore his career, or grow into old age. This strikes a particular chord with me because Blaine was born only one month before me. I recently had a birthday and thought of him, and the many years of birthdays he did not get to celebrate. When Blaine enlisted, he knew the risks, but he was the kind of man who felt a strong duty to be helpful, work hard, and be a protector. I am grateful for his service to this country. Thank you to Kenda and Millissa Adams to sharing Blaine’s story with TSP. He is not forgotten. On a cold and rainy Veteran’s Day Weekend of 2018, I had the honor of carrying the “Stairway to Heaven” stone and story of PFC Blaine Adams. I wholeheartedly enjoyed learning about Blaine’s life as I prepared for this journey. I especially loved hearing about his personality and what made Blaine the young man he was. He sounded like quite a guy, who loved his family and country. The loss of him must have been devastating to you all. I come from a military family with a stepfather, brothers and two stepsons that served and am so proud of my husband who served for 26 years. I have never served our nation, but have worked for the VA for 9 years. I honor veterans every day. I connected with Blaine’s story and stone on a deeper level though, feeling the weight of his stone as I hiked on 11-11-18 and did the 4 mile walk on 11-12-18. You see, my brother died in 1996 while serving in the US Navy from cancer. The similarities to my brother and Blaine’s personalities were uncannily alike. They both enjoyed hanging out with family and friends, golf, weight-lifting, hunting and fishing. When we were kids, my brother and I once caught and kept a snapping turtle for a bit until our mother forced us to set him free. My brother even studied carpentry for a year, like Blaine. I felt the heaviness of your loss as I carried Blaine’s stone. At times, while we were on the summit of Blue Hill Mountain I had difficulty speaking as I was so overcome with emotion. I did the best I could to honor him and tell his story. I don’t think Blaine’s story came to me by accident. I carried both his stone and story with my whole heart and took time to reflect on his life and your vast loss. Please know, that I will never forget Blaine or this experience of carrying his precious stone. I know that nothing will ease your pain. Just know that I will forever keep Blaine in my heart and am grateful that I had the chance to honor him. So proud to know you Jess. Especially as I am from the Farmington area, worked with you and Tim at the VA and am also a veteran. Thank you. What a beautiful and heartfelt description of your experience. I feel like I was with you as you honored Blaine and your lost brother. You are an amazing daughter and I am so very proud of you. I love you. 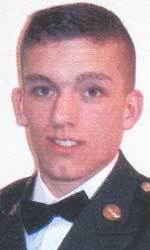 Today is the 10 year anniversary of my brother pfc Blaine Adams death. These years have been hard, long and lonely. I have cried, screamed, fell apart, struggled to go on, smiled and laughed. My son Lucas was only 11 months old when his uncle died. He doesn’t remember my brother but I let my memories of him live through me so my son knows his uncle and that he loved him more than anything. It’s hard their bond was so strong and was so short lived. Lucas still has the power wheels truck Blaine bought him at around 6 months old. On my brothers birthday we go to the cemetery to celebrate by having cake, ice cream and balloons. When my brother was a young teen In September when the local fair came into town my brother went around and picked cans and bottles for money. He made quite a bit. November is veterans day which is always hard. Continuing into Thanksgiving which was the last holiday we spent with him before he passed then the 29th of November comes along the anniversary is a big struggle. Once we make it through that then there’s Christmas. A time for family and friends sharing memories and now for the holiday season there’s an empty chair. So if I had to say August November and December are the worst months in our grieving journey. the events that happened while we were there before Blaine died after we got the call haunt My dreams. While we were there my brother woke up just one time in a quick instant look down at the tube in his throat look panicked scared to death we told him it was alright. to me it was a glimmer of hope he would be okay. to this day that look destroys my heart it feels like a nightmare when that image pops into my head. He ended up having a pacemaker put in. the situation was too much for us so we went downstairs to have a break. when we came up there was people around the area where you go into Blaine’s room. I froze right there. told my parents he’s gone. my mom said what and then we are called into a small room and got the worst news we could ever possibly imagine. In that moment we were in shock we were numb devastated sad in disbelief we never thought this would happen we knew if he actually went to war there was a great possibility but in a training accident it should not happen in my opinion they need to get more experienced so this does not continue to happen to our loved ones. It upsets me when they say he signed a paper so there is nothing we could do even though negligence was admitted. I feel that they sign the paper knowing I could die serving my country but how many really believe they could die during training. Please don’t get me wrong I appreciate everyone that serves our country I know mistakes can happen. One of the things in the report said that they even threw a chair in beside my brother to show he was okay who does that you see someone having trouble in a pool you get in there immediately those few seconds could have saved his life but he is gone our hearts are broken and incomplete. I want to say THANK YOU to all that have honored my brother. He loved to travel and thanks to all of you you he gets to. Thank you to all that has served and especially to your families, they serve as well- sharing their loved ones is a sacrifice and my family and I are very grateful for you. Happy holidays. If you have lost your loved one as well please no you are not alone. Thank you, Millissa, for sharing your story and memories of your brother, Blaine. His service and sacrifice, and the sacrifice made by each of you who love him, is not forgotten and we will remember, always. We thank Blaine, today and every day, for his willingness to serve and endeavor to ensure that his memory and legacy live on. First and foremost, I cannot thank you enough for the distinct honor and privilege of carrying Blaines stone in the Millinocket Marathon and half. I assure you I took this honor with complete focus, admiration and humble appreciation. It was over Veterans weekend that I discovered I would have Blaine as my focus for my first ever half marathon. I briefly read his bio, as I knew I would be delving into his life story more in depth as the time went on before the half marathon. While I sat in my car reading his bio before heading home after our veterans event, a wave of emotion overcame me. Not only had he passed at the same duty station as my own brother, but being from Millinocket and yourself being in East Millinocket….the significance of this distinction was not lost on me. I had never been more determined to honor one of our own. I had spent an amount of time preparing for the half marathon. Running stairs, treadmill miles, and bike miles. All the while I could feel Blaines presence as I knew he wanted to bring out the best in me. And from what I had continued to learn about him, that was one of the many things he was great at. He not only pushed himself, but he was even greater at bringing out the best in others. So I made my way to my little hometown. The fanfare was breathtaking, the townspeople were joyful and the town had sprung into life in a way that I hadn’t seen since I was a kid. The best way I could describe it was a little hometown coming together like you would see in a Hallmark movie. I made it to the American Legion where Blaines stone was. And oh what a beautiful stone, how could that not catch your eye. I had dinner (spaghetti to carb up of course) and then said my goodbyes. But what I was most anticipating that evening was finally having a piece of Blaine physically with me. Something tangible that I could hold close to me. I couldn’t keep that excitement to myself so I was overjoyed when I reached out to you to discover you were home and wanted to also hold his stone in your hand. What I remember most about the night I met you was how you were waiting in your big picture window for me to pull in. I immediately thought of a mom waiting for her boy to come home. You were so welcoming, loving and so forthcoming with stories of Blaine. Stories of your trip to Germany to honor him and his days of wrestling among others. The look on your face as you held his stone for the first time in years is something I will forever carry in my heart. I can’t thank you enough for allowing me to be in your space surrounded by all of Blaines items, awards and pictures. I was truly reminded of how loved and missed he is. Marathon morning arrived and to be honest I was scared to death. Would I finish this race? Would I let Blaine down? I could not have been more wrong. The morning started at 12 degrees and was forecasted to dip into below freezing temperatures. The music was uplifting at the starting line, the atmosphere was indescribable. And so I was off. Going up the Golden Road I hit a headwind going uphill. The chill hit me and my first thought was “Am I going to make it? This is the first hill”. Then I felt Blaines stone on me and pushed on. Again, he brought out the best in me. Then we hit mile 2, mile 3, mile 4….and the wind suddenly didn’t seem to not matter any more. The sun was shining and when we turned Huber Road at mile 6, the wind was at my back. I spent that time with my friend Pattie as we walked sharing stores between each other of Blaine as she carried Aaron. The ripple effect of his presence overflowed during those 13.1 miles as I just kept finding myself pushing, all while repeating “one more mile for Blaine”. Blaine gave me hope that day. I am forever changed because of him. I am beyond humbled by your generosity in sharing him with me. I look forward to continuing to share his story. He will never EVER be forgotten. I work for a non-profit in Bangor and we currently have the honor of hosting the display of stones. What a tribute to these fallen heroes. As I look at his stone and the memorial every morning, it reminds me why I love this country so much. These soldiers had gave their everything to protect us from danger and some gave their lives for us. And for this I will always remember PFC Blaine and the rock you had chosen for him. For I also believe there is a stairway to heaven and we will see other soon again. This young man had such a deep impact on not only his soldiers but all who knew him. I want to wish you a Happy Valentine’s Day and thank you PFC Blaine for his service to our country. Thank you! !